Young Koi fish in a blue plastic tub at Koi show in California. Koi are a variety of the common carp, Cyprinus carpio. 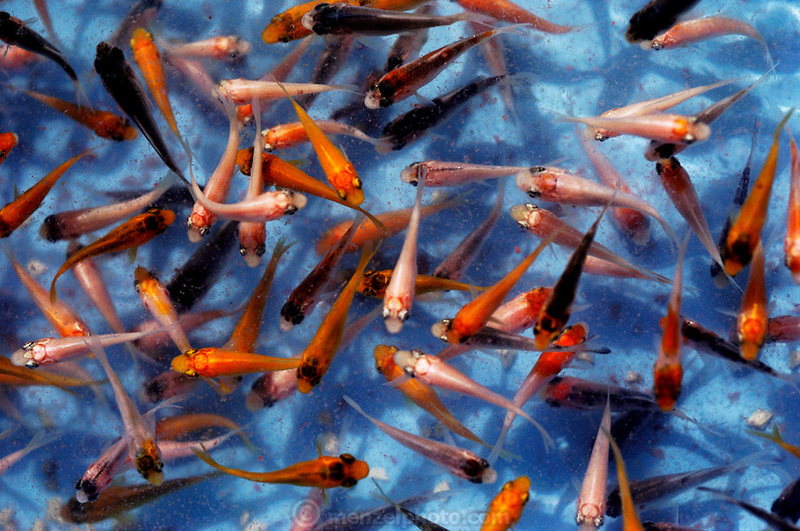 Today Koi are bred in nearly every country and considered to be the most popular fresh-water ornamental pond fish. They are often referred to as being "living jewels" or "swimming flowers". If kept properly, koi can live about 30-40 years. Some have been reportedly known to live up to 200 years. The Koi hobbyists have bred over 100 color varieties. Every Koi is unique, and the patterns that are seen on a specific Koi can never be exactly repeated. The judging of Koi at exhibitions has become a refined art, which requires many years of understanding the relationship between color, pattern, size and shape, presentation, and a number of other key traits. Prize Koi can cost several thousand dollars.